← ARE YOU AN ANGEL PARENT? THINK BULLYING CHILDREN HAVE BULLYING PARENTS? Think again. For while it is true a child beaten and bullied at home, or raised without values, is more likely to become a bully, the studies show as few as 30% of abused kids become bullies. Here is the more traditonal view as put forth by Lianne Castelino of www.whereparentstalk.com. Here is a slightly edited version of the comment I posted on Lianne’s blog. Do remember I am dysgraphic and am forced to practice “good enough” and not perfection in my unedited writing. Briefly, bad apples might not fall far from the tree, but that doesn’t mean the tree is to blame when an apple goes bad or doesn’t reach its full potential. Might be the wrong mix of genes, not enough sun, too little rain, an unlucky lightening strike, crowding by other apples, worms. I think you get the point. Our children are being raised in an unhealthy culture that preaches “Just do it” instead of do it with kindness. We the parents need to take a stronger stand against unhealthy values. I am not a preacher, a daily bible reader, but if the Golden Rule–which was first written in by a Hindu Pagan–was given the press of “Just do it” values, bullying might not die, but would be seriously wounded. What’s a parent to do? Lianne and I agree about much so as she suggests parents need to take on the hard task of teaching their children caring values. Moreover, they better live by those values. A stunning example of good parents doing bad things–Thank you, Trevor O’Keefe for that paraphrase of my book’s title–pops to mind from the days David was coaching kids soccer. You may not know this but in most leagues, teams move up and down the rankings in part by what league they play in. Where we lived the A league were the winners. The B league were the sometime winners and occasionally a B league team would move up to the A league . Of course that meant they would usually be soundly trounced at every game. When the kids my husband coached were mainly B league, for example, for a season they played A league. Anyway, to cut to the point, David’s team lost every single game that year. To lift morale, we decided to have a picnic following a kids versus parents game. Now we naively thought the parents would not play their hardest. Foolish us. We stopped the game because it was clear that too many parents “were in it to win it” not to have fun. Now, I would insist on handicapping the parents. Make them walk while kids ran. Or for bigger laughs, tie two parents together so they have to run and play three legged. We are an “In It to Win Society.” Moreover, the media strokes and makes money off that human tendency to want to be a winner. Witness TIME magazine’s stirring up angersabout nursing moms. Drives this aging woman off her rocking chair. Tip two: Also teach your child solid self defense skills. 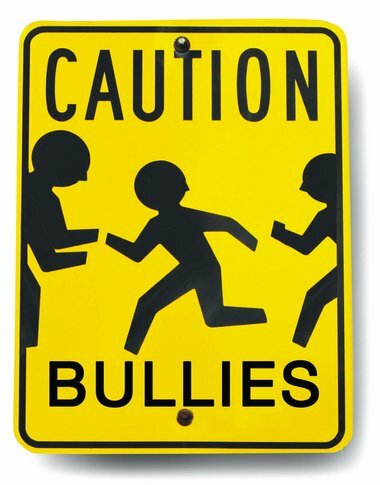 Being too kind makes you a target for bullies. Tip three: Unite to force the media to promote caring values. I do see some ads suggesting that. But we need a true cultural revolution to stop the bullying. Self disclosure note: Lianne (from Where Parents Talk) is interviewing me via Skype tomorrow. That is why I read her blog and was inspired to write this. PRACTICE KINDNESS. Sharing is caring and if you think this worth someone else’s reading share it. I for one will be appreciative and sometimes the other person might thank you also. This entry was posted in News, Parenting Issues and tagged A Bullying Society, Bullying, help for parents, how to parent, Katherine Levine, Lianne Castelino, Not just parents, parenting, Parenting advice, parents, postaday, Thinking about what matters, tips on parenting, When Good Kids Do Bad Things. Bookmark the permalink.